As summer rolls in, your use of air conditioning and refrigeration is bound to ramp up, at home and at work. As it does, heat exchangers are involved in the process. When you take a dip in a swimming pool you will notice if the water is the right temperature or not, and your level of comfort is directly influenced by the plate heat exchanger that controls the water temperature. Apart from leisure activities, fluid temperature control also plays a key role in food safety, keeping liquids chilled or sterilized. There are many heat exchange devices out there, but what gives plate heat exchangers a leg up on other ones is the fact that they are smaller, more compact, and easier to build. It is possible to install both the condensing and the vaporizing sections in order to save space, weight, and installation costs. This is especially important for instances where there is not a lot of room to install devices, making them the perfect option for tight spaces and construction plans with time constraints. 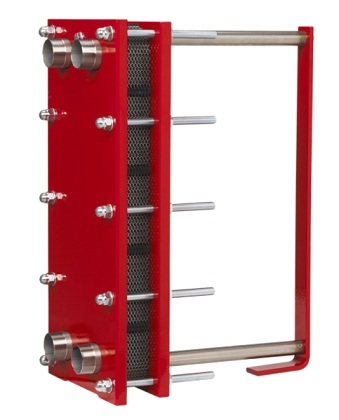 An interchangeable plate heat exchanger, image courtesy of Varem S.p.a. In the micro-world, where space is an expensive commodity, a MEMS plate heat exchanger works with these same basic principles. Here, you want to exchange as much heat as possible, in as small a volume as possible, and thus maximize the contact between the exchanging fluids. A sinusoidal pattern to the plates separating the fluids helps with this maximization. A section of plate heat exchanger geometry. The medium that the MEMS plate heat exhanger relies on is plain water, and the operating temperature can be anywhere from 25°C to 80°C. 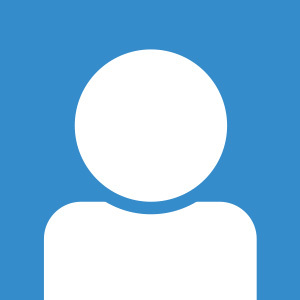 The viscosity and heat capacity change significantly as functions of the temperature. A laminar inflow boundary condition with an average velocity of 15 mm/s and a temperature of 25°C is specified at the inlet. The corrugated walls have no-slip conditions for the velocity field and a fixed temperature of 80°C. When determining how effective a plate heat exchanger is, pressure drop, the overall heat transfer coefficient, and mixing-cup temperature should all be considered, as well as the significance that either conduction or convection plays on the heat transfer. 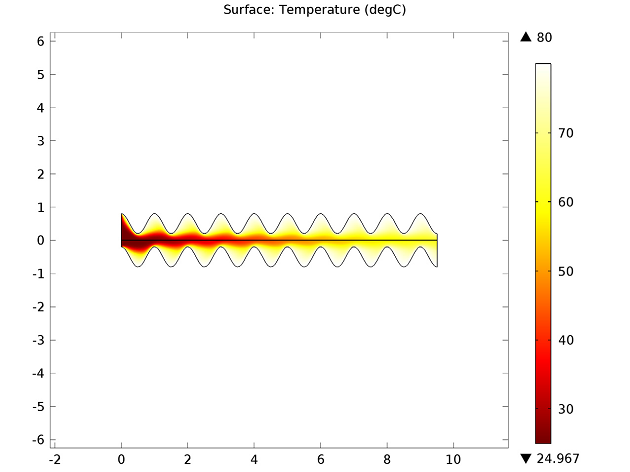 With COMSOL Multiphysics, the tools are available to try out many potential designs and fluids, and with simulation you can really optimize them. I have done project on CFD analysis of Plate Heat Exchanger using Fluent. My chevron angle was 30 degress (with vertical). >> What is the chevron angle in the above mentioned study? >> Was this model optimized for oxide-based nanofluids as a coolant ? 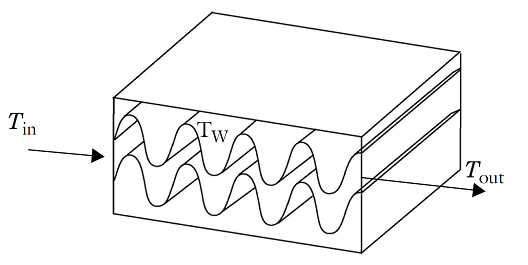 As the plate temperature is fixed (80°C) at the corrugated walls in the cross section represented above, the chevron angle does not affect the result for this cross section representation of the heat exchanger. In the results shown above, pure water has been used as a coolant. However, loading material properties of a nanofluid in the model and solving it again is all you need to simulate the behavior of the heat exchanger with enhanced thermal properties of the coolant and to account for reologic properties (for example different temperature dependency of its viscosity).